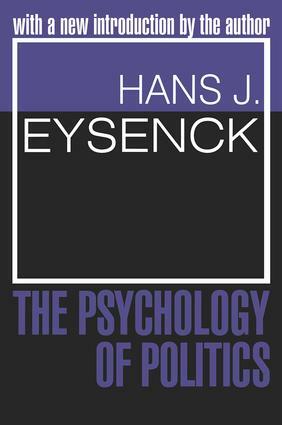 In writing The Psychology of Politics, Hans Eysenck had two aims in mind: to write a book about modern developments in the field of attitude studies which would be intelligible to the layman; and one that would integrate into one consistent theoretical system a large number of contributions on the topic from different fields. Eysenck believes that science has something to say about such problems as anti-Semitism, the origin and growth of fascist and communist ideologies, the causal determinants of voting behavior, the structure of opinions and attitudes, and the relationship between politics and personality. He seeks to rescue these factual findings from the obscurity of technical journals and present them in a more accessible form. The research presented in this book outlines the main principles of organization and structure in the field of attitudes. These principles account in a remarkably complete and detailed manner for the systems of political organization found in Great Britain, that is, the Conservative, Liberal, and Socialist parties, and the communist and fascist groups. Next, Eysenck relates these principles to the system of personality structure which for many years formed the main focus of research activity at the Institute of Psychiatry in London. The Psychology of Politics integrates attitude research with modern learning theory. In his new introduction, Eysenck writes that his research and personal experiences in Germany led him to believe that authoritarianism could appear equally well on the left as on the right. He saw Stalin as equally authoritarian as Hitler, and communism as equally totalitarian as Nazism. The Psychology of Politics contains the evidence and arguments Eysenck used to demonstrate his approach. This volume is of enduring significance for psychologists, political theorists, and historians. It is by indirection a major statement in modern liberalism.